The Good / Um...hang on...I'm still thinking... Yeah, there is nothing good about this one. The Bad / For just $1, your credit card will be charged $39/month in just 3 days, then $29/month soon after for the additional "training." My Recommendation / Save yourself the hassle of calling your credit card company with multiple charge disputes and stay away from this work-at-home scam. Check out our number one recommendation on how to build a business from home instead. 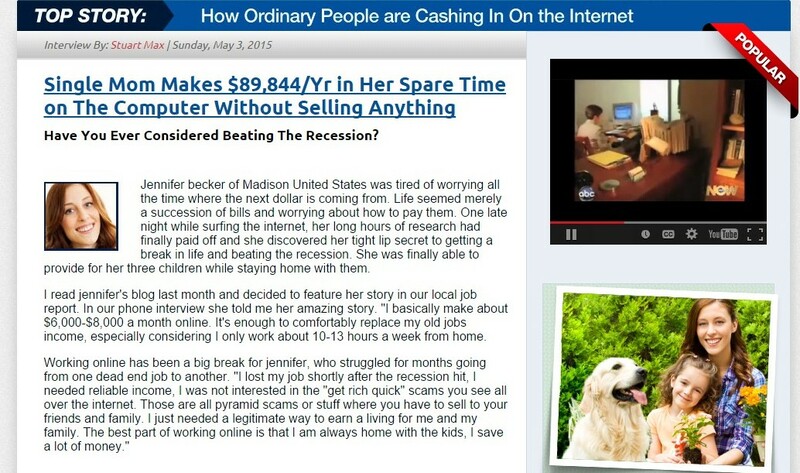 With the Good Money video running in the background of this fake news web page, I recalled a similar work-at-home “business opportunity” that I’d reviewed back in March. In fact, if you look at the format of the “news” story posted above and the “news” story posted for Work at Home Paycheck, they are almost identical. However, this opportunity was being touted by Jennifer Becker, a mother of three living (coincidentally enough) in my home town of Madison, Wisconsin. Jennifer discovered a “tight lip secret” to making money at home and wrote about it on her blog (wait, does that even make sense?). As a result, she was interviewed by Home Lifestyle Report. 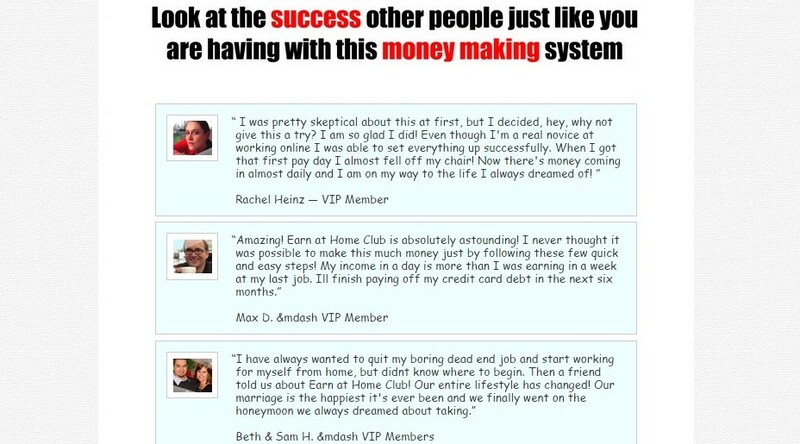 Jennifer Becker sure gets around: She’s also promoted other work-at-home systems including A to Z Cash System and My Home Cash System. These systems still exist online, although the majority of their buttons and links have been disabled. What exactly is Earn at Home Club? That part is never actually explained, but apparently it requires a computer. Somehow or other, it also involves making money on the newest craze called the Internet. If you input your information here, you’re next taken to this sales page. Notice the timer running in the background that makes it seem like you need to sign up now or risk missing out on this opportunity. This timer magically resets itself when you refresh the page or try to click away from it. But it’s only $99 $4.97 $1! Initially, you are asked to pay $4.97 to access Earn at Home Club, which is a huge discount compared to its initial price of $99. However, if you use your back button a few times, the price drops to just $1. What a deal, right? Enroll today and your card will be charged $1 to validate it.You will then be given a 3 day trial period from your authorization date,at the end of this period unless you cancel your trial,the program’s full price of $39 will be charged and after 30 days $39 every 1 month until cancelled to the card you signed up with.In addition to this you will receive a 10 day free access to the facebook training. After 10 days, if you do not cancel we will charge you for $1 and three days later $29 per month until you cancel. You may cancel at anytime and have a 90 day money back guarantee!. Arguably, you could call up the program and cancel your membership before your trial is finished. However, there is a little problem with that plan- from various scam and review sites posted online, people who have already been burned by Earn at Home Club report that the chat agents disconnect from the chats after someone logs in and reports an issue. Likewise, it’s incredibly difficult to downright impossible to reach a support agent by phone. However, if you inspect the links within those pages, you’ll find that they are affiliate links. Apparently, Earn at Home Club offers its affiliates a $25.50 commission for each person that signs up. Appeal to the emotions. Scammers go on and on about how bad the economy is to incite your anxiety, or about their lavish lifestyles to make you envious. Limited time opportunity. You only have X amount of time to sign up or there are only 10 places left before this offer expires. Easy money. The scammers mention how you’ll “make money while you sleep” or use a turnkey or push button system to make loads of money per day. Money- not the work involved to earn it- is emphasized. Little or no information. Very little, if any, information is provided regarding how the money is earned or how the business functions. Terms like “proprietary” and “secret” are frequently used. Fake testimonials. The testimonials are all fake, the customer photos are stock photos, and the persons involved don’t even exist. Short or no refund terms. The time to obtain a refund is either extremely short or non-existent. Little to no contact info. You have no clue who is taking and processing your order and who to reach in case of a refund or cancellation. The bottom line with most work-at-home scams is that, if you can’t explain how the “business opportunity” works to your own grandmother, then you should be extremely leery of signing up and (especially) providing your contact information. They are liars and thieves I paid 5 bucks AND a dollar they don’t tell you about. Then I went to the website and now for over a week all it does is tell me “Earnathomeclub.com says True” and then IT DOES NOTHING!!! I don’t know about any of you but I myself am retaining a lawyer friend and I’m thinking about 5,000,000 should do it!! I HATE liars and thieves!!! 77 dollars charged but know explanation why. Disputing this with my bank and them now. Funny how this Jennifer Becker shows up with “your home town” or another home town…..scam! DO NOT waste your time with this…. Thanks for this nice interesting article. I was looking for the reviews before going into that because I was really skeptical about this, why should they give so much money for a job which could be made by ordinary employees? Thanks again for this great info. Wow! I get so many of these email offers I decided to Google the reviews of this one, and what do you think… It’s a scam! They have the same lady Jennifer on my email but she is now located in Orlando, Fl. Lol. Thanks for this website and the info, also the comments too! Got an email of a “golden” work at home opportunity. Didn’t see brunette Jennifer, but instead got blond Emily with the exact same story. Lol. Thanks for the heads up! Call your bank and have them send you a new card (with a new number) and ask them to reverse the charges. Even if they don’t reverse them, you’ve still stopped them from billing/stealing from you. In this situation, being charged and having no real way to stop the charges, order a new card from your bank and explain the situation to them; they might reverse the charges, and even if they don’t, you’ve found a way to stop them from “billing” (stealing from) you. Hey, she must have a summer home in my hometown too. I just checked my account and got charged 77.00 from these people and I don’t know why or how can then just take money. How can i stop this? Go to the Web site, log in and go to the online chat. You get online support immediatly and demand them to cancel your account. Because of this website I saw I was about to be charged and so I logged in, clicked support, you can call, wrote a ticket, or get online support. I choose online support. They asked me to check it out for a day and get back to them. I said NO CANCEL NOW and they immediatly canceled my account and said I wouldn’t be charged again!